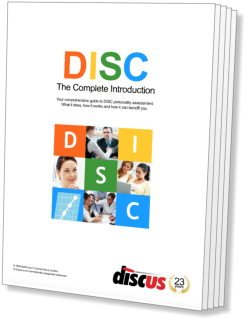 The 'C' of DISC stands for Compliance, a factor connected to accuracy, organisation and attitudes to authority. 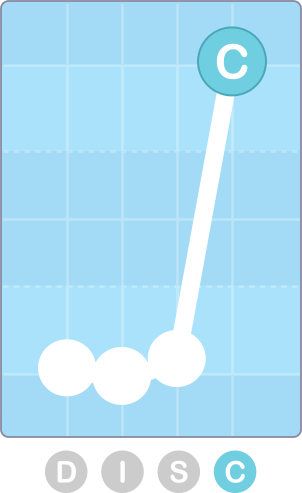 A person's level of Compliance or 'C' is shown last on a DISC graph, in the rightmost position. A person who shows high Compliance in their DISC profile has a concern for practicality and detail. The key to this factor lies in attitudes to authority; High-C's are concerned with working within the rules, and indeed are often described as 'rule-oriented'. This applies in more general ways, too: they're also concerned with accuracy and structure, and understanding the ways things work. 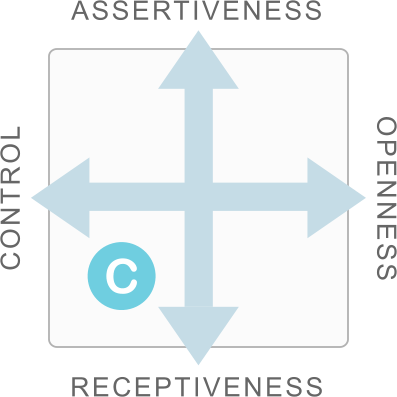 This attitude is explained by the position of Compliance on the Style Card, which describes it as Controlled and Receptive. In other words, Compliant people have a focus on goals and achievements, but lack natural assertiveness to control events. Thus they tend to concentrate on working with structure and planning rather than taking direct pro-active action. Compliance lies in the bottom-left quadrant of the Style Card, where Receptiveness meets Control. People with high Compliance like to have a clear idea of their role, and what's expected of them, so they are far more motivated in situations that are clearly regulated and planned. In general, such people are not independent by nature, and will prefer not to be left to make decisions or take actions without the support of others. If high Compliance relates to ideas like structure and accuracy, then low Compliance in a profile reflects a person who places little emphasis on matters like this. Such people don't naturally focus on the need to plan ahead or anticipate problems; instead, they have the confidence to rely on their own instincts. While a High-C will rarely challenge authority or risk breaking a rule, a Low-C person has a much more independent and unconstrained attitude to their life and work. The natural focus of a person with high Compliance is on details, facts and figures, and they'll be motivated by roles that give them the chance to apply this central focus of their approach. High-C's - at least those without other factors in their profiles - tend to be at their best when they have time to organise and plan their work. The fact that people like this have an analytical approach, and that they're ready to follow procedure, makes them well-suited to roles we might broadly categorise as 'technical'. That would include the kinds of work that we normally think of as technical, such as engineering or programming, but the same idea can be extended to roles needing similar skills, such as (for example) accountancy or project planning. A High-C's affinity for questions of accuracy and regulation means that their personalities also tend to suit situations where standards need to be applied. An obvious example would be quality control, but they might also be effective auditors, editors, actuaries or statisticians: work where following a consistent methodology is crucial to their effectiveness. Each of the four factors is well suited to some situations, but adapts less well to others. Here, we'll take a look at a few potential working situations in which high Compliance will have an effect on a person's responses. Planning and organising tend to be second-nature to people with a high Compliance score, and indeed they will often plan their activities even when it's not formally necessary. Their focus on detail means that they can sometimes become so absorbed in the intricacies of their planning activities that they lose sight of the broader goals. High-C's can be quite effective at presenting information, so long as they feel confident in their expertise and they feel in control of the presentation. They can feel far less comfortable if they need to discuss topics without preparation, or field unpredictable questions. A person with high Compliance will tend to solve problems using rules and structure, and so in a dispute such a person will naturally try to work out a solution using logic and rational argument. High-C's can see the value in compromise, and are generally ready to resolve problems by reaching a mutually agreeable accommodation. Rule-orientation: High-C's like to work within an established and well-planned structure, rather than relying on their own resources. Organisation: People like this will want to feel that they understand the details of their situation and how they fit into it. Precision: Highly Compliant people are concerned with getting things right, and take time to ensure their work is accurate. Caution: People of this kind will tend to avoid risks when they can, preferring to take a cautious approach whenever they can. Tact: People of this kind tend to be rather reserved in communication, using diplomacy and tact and focusing on matters of fact.